Now that you’re gluten free, are you missing wraps? These easy, cheesy grain free gluten free wraps are made with simple gluten free pantry ingredients—plus they stay flexible even when they’re cold and freeze beautifully. Gluten free wrap nirvana! One peek inside my children’s lunch boxes, and you’ll see that these soft gluten free wraps made from tapioca flour in the style of Brazilian cheese bread are the star of the show. Unlike most gluten free recipes made with an all purpose gluten free flour blend, these wraps are made with only 1 flour: tapioca starch. 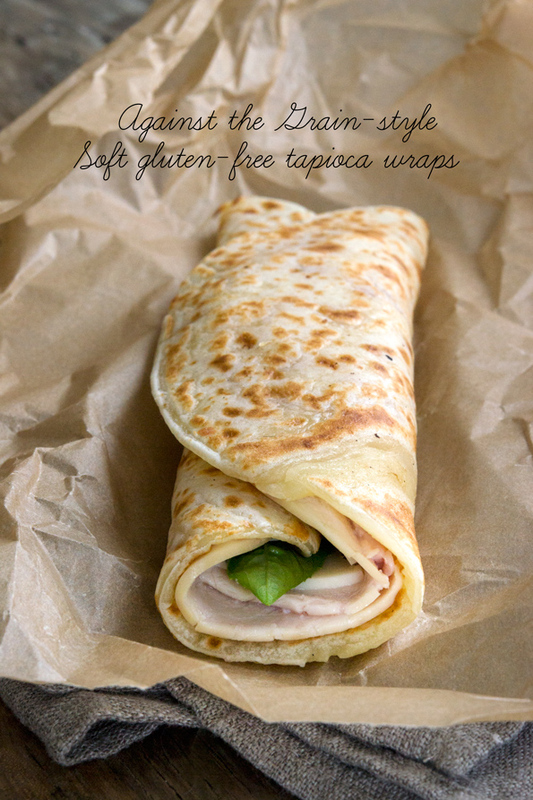 These gluten free wraps are soft and flexible, and are simply. not. going. to. break. For lunch, I like to fill them with turkey and basil, with a nice spread of hummus. For dinner, we love them with c0le slaw and chicken fingers. They’re also perfect spread with hummus and stuffed with julienned vegetables. These wraps are really super easy to make, and (as if you needed more!) the dough can be made ahead of time. Just wrap it tightly in plastic wrap and store it in the refrigerator for a week, or in the freezer for even longer. If you do freeze the dough, be sure to wrap it in something freezer-safe to avoid freezer burn, and let it defrost overnight in the refrigerator. Then use the dough straight from the refrigerator because it’s easiest to work with the dough when it’s cold. The dough rolls out simply and easily, too. Win! Just be sure to pay close attention to the recipe note about the type of tapioca starch/flour that I recommend. Many brands simply are poor quality, and won’t work. Oh, and before you ask … I’m afraid these are just not a good candidate for making dairy free. They rely upon 9 ounces of cheese total in 10 wraps. *I only recommend buying tapioca starch/flour from nuts.com or Authentic Foods. Bob’s Red Mill tapioca starch is of inconsistent quality. Do not buy tapioca starch/flour from the Asian food store as it is frequently contaminated and will not work in this recipe. In a medium saucepan, bring the milk to a simmer over medium heat. As soon as the milk begins to simmer, turn off the heat and add the tapioca flour and salt, and then the oil. Mix to combine. The mixture will look curdled and will be difficult to bring together. Allow the dough to cool for at least 10 minutes before transferring it to the bowl of a food processor fitted with the steel blade. Pulse a few times to smooth out the dough. Add the beaten egg, and pulse until the egg is incorporated into the dough. Once the egg has been added, turn the machine on and allow it to work until the dough is smooth (2 to 3 minutes). It will be very thick and stretchy. Add both grated cheeses, and turn the food processor on and let it work until the dough is very smooth (about 2 minutes). The dough will be sticky, but will become less sticky as it cools. Use a wet spatula to remove it from the food processor. With wet hands or kitchen tools, divide the dough into two equal pieces, and wrap each tightly in plastic wrap. Place in the freezer to chill for about 30 minutes or in the refrigerator for 2 hours or up to overnight. Once the dough has chilled, heat a 10-inch cast iron skillet over medium heat (or a nonstick skillet over low heat). Unwrap one chilled piece of dough and place on a flat surface lightly sprinkled with tapioca flour. 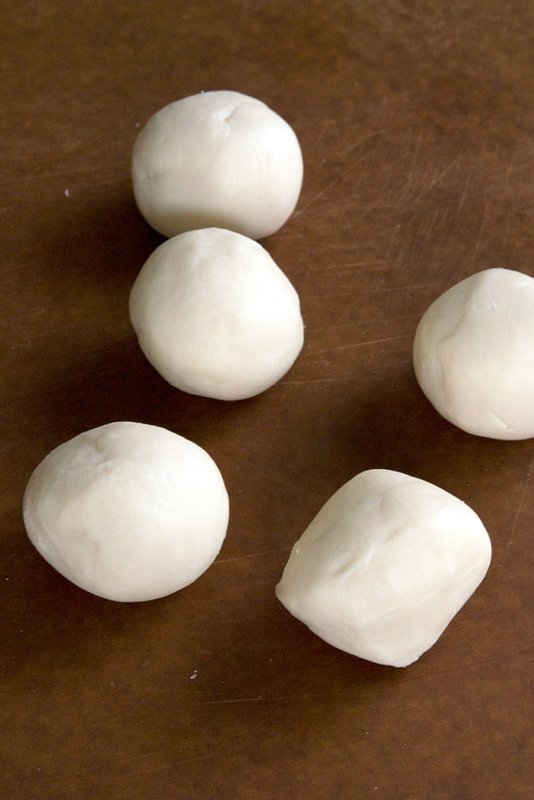 With a sharp knife or bench scraper, divide the dough into 5 equal pieces, each about 3 ounces. Dust each piece generously with tapioca flour, and roll out into a circle 8-inches in diameter, moving the dough often and sprinkling it with tapioca flour when necessary to prevent it from sticking. Carefully place the first circle of dough onto the hot skillet and allow it to cook until the underside is cooked and the wrap can be lifted easily with a wide spatula (about 1 1/2 minutes). Flip the wrap over and press down evenly with the spatula to sear the other side. Cook until the underside is set (about another 40 seconds). Remove from the skillet and cover with a moist tea towel. Repeat with the remaining 4 pieces of dough, and then with the other half of dough. Serve the wraps immediately, or wrap them tightly in plastic wrap and store in the refrigerator for up to 1 week (or in the freezer, wrapped in a freezer-safe container, for longer). 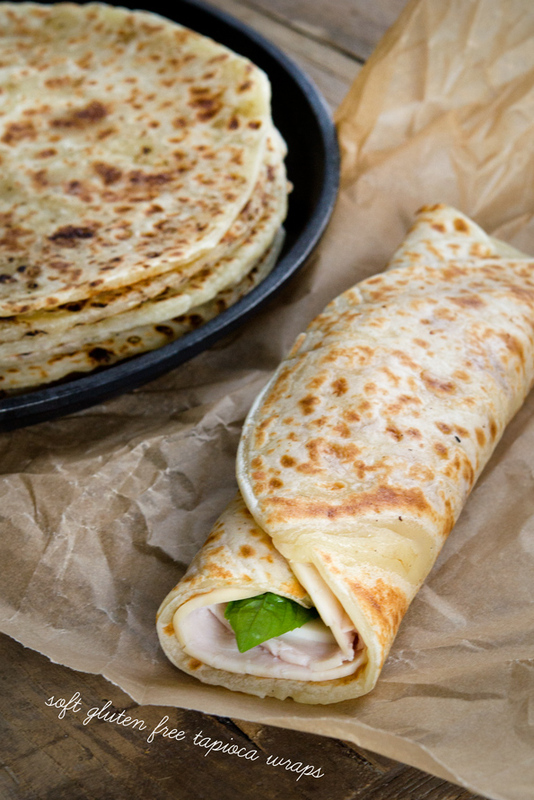 When you are ready to use a previously refrigerated wrap, warm in a hot cast iron skillet for a few second until the wrap has become pliable again (about 30 seconds). P.S. Thank you so much for your support of the Gluten-Free on a Shoestring Cookbooks, both old and new! Your support makes everything possible. Thank you for all your efforts to share such good recipes. I tried these flatbreads and found the dough really difficult to process in the processor. Almost burned up the motor. Did get it together to finish the process. They are awesome! Just need to know if the dough should be that tough to process? Found this interesting since someone said their dough was like a thick cake mix. Thanks! Becky, try letting everything cool down for longer before processing. It is most likely that the food processor got overheated, not that the motor was burning out. If I don’t let it cool down enough, my motor slows and nearly stops. And if someone said their dough was like cake batter, they probably used a poor quality tapioca – or didn’t use the proper method. These look un-freaking-believable! I’d happy eat that wrap for lunch every day of the week. These are fantastic! They really remind me of staffordshire oatcakes – soft and chewy. And as they are traditionally eaten with some combination of cheese, bacon, sausages, onions and mushrooms, these are a perfect replacement. Hi, Ruth! Cheese, bacon, sausage, onion and mushrooms sounds like heaven. It sounds like you’ve got back an old favorite! I’m such a pest….are these paleo? Some times Im confused. Thanks. They’re not paleo, Joy. Paleo doesn’t allow cheese. Don’t worry about the label, though! Can I use any kind of Milk? Like almond milk? Most likely you could use almond milk successfully, Deb, but the cheese is still an essential ingredient. Do you think a tortilla press would work instead of rolling these out? I don’t know, Julie, but it’s worth a shot. They’re very easy to roll out with a rolling pin, so I never tried! Any idea on great tapioca flour options in Canada? I am so darn excited to try this!! Have your books, can’t wait to get the bread one! You can grind up pearl tapioca (the kind you buy for tapioca pudding) in your coffee grinder. It may take awhile, Google it and you’ll see people talking about it. Grinding up pearl tapioca will not work in this recipe, or the others like it on my blog. I am so excited to try these that I don’t want the wrong quality to mess with my success! I have a question. Should the “dough” be very runny after adding everything and mixing in the food processor, before putting in the freezer? My dough was more like thick cake batter consistency. I’m freezing it right now, hoping it will firm up enough to roll out. I double checked all my ingredients and quantities/weights, and am using tapioca flour/starch from Authentic Foods. So I think I did everything right. Here’s hoping it will be ok. These came out ok after chilling. I found the “dough” to be very delicate while rolling out. Once they were fried in the cast iron pan, they were awesome! Flavor is great, you don’t really notice the cheese. It would be good to add a little garlic powder. If rolled out thicker, they make good pita type bread. I can see a lot of possibilities. My daughter loves flour tortillas for tacos, so this will be perfect for her. Thanks for the recipe. That sounds like an issue with your tapioca starch/flour Chris. Brands other than the ones I specify tend to perform very, very differently. Next time, try a higher quality tapioca starch. Can you use any kind of non-dairy milk instead? I don’t know, sage, but nondairy milk should work okay. You’ll have to experiment! Thanks Nicole! It was two thumbs up from the gluten-free boy in panama!!!! So glad, Gina! Thanks so much for the nice note – and I hope you are able to stay away from those crazy expensive rolls! 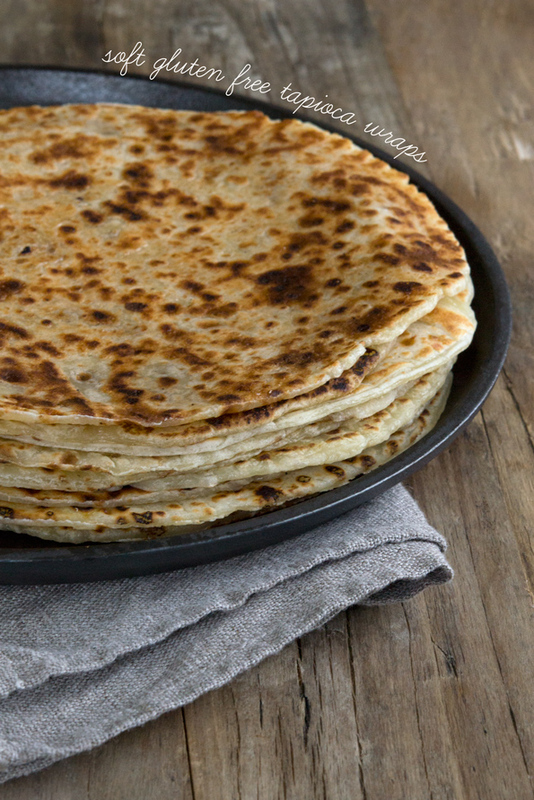 I’m a fan of your tortillas and can’t wait to try these – woot! would better batter work instead of tapioca flour? I’m afraid it absolutely would not, Roxi! What do you think of ener- g brand tapioca starch? I use this brand and no issues with baking. I’ve never tried it, Bryna. It’s worth a shot! I do not own a food processor, what can I use instead? I don’t know, Chris. You can try using a stand mixer, but it is harder to get a smooth dough. These MUST be good if you were willing to get out your food processor! You know Donia – I was thinking the same thing – made me laugh this morning! I’m going to try using an Almond or a seed cheese. It’s a lot of cheese, so I don’t know what the result will be, but you should give it a try as well! Let us know here what your results were! Karina, the almond cheese or the seed cheese that Tammy mentions are non-dairy. Im sorry, I should be more specific, the one I found has casein, and I think corn? but def casein. ANd, we can’t do casein :( any milk enzyme. Odd. I’ve not found one that does, in either the seed or nut variety. Most are aged with vegan acidolphisus (sp?). Good luck! I know it’s not right to be this excited about a wrap that tastes good and is flexible but holy cow am I right now!!! THANK YOU! Also, went and bought some freeze-tite and snapware after your reminder about that post! totally forgot about that one. And, I made the PB cookies with sunbutter. They are ok – just really for taste only. Technically the recipe turned out fine though the dough was greasy and the cookies were completely normal looking. If you use sunbutter religiously – you’ll love them with it. I hear you, Jennifer! These are, in fact, very exciting. Add in the fact that the dough is easy to make, plus it can be made ahead of time and these are legit for an everyday wrap. Good to know about the PB cookies. I don’t know much about sunbutter, but it sounds like it behaves differently. Thanks so much for reporting back! Could you use a nut cheese, like almond cheese? you should give it a try and see how it goes! Absolutely beautiful! I’ve been waiting/looking for a soft wrap…can’t wait to try. Funny you mention Brazilian cheese bread (Pao de Queijo) as I found a recipe last week on Globetrotter Diaries and I would have never thought to make them into wraps. Brilliant idea! Can’t wait to try this! I’ve been so lazy lately eating gluten foods, feeling ick. This is my inspiration to behave again, thanks so much. Love your stuff…. ahhh where would we be without you? Don’t cheat, Em! So glad you are inspired to treat yourself well. You gotta take care of #1!